Tuhavi has been providing high quality, honest and reliable commercial construction services for Tucson businesses for decades. Let us help you make the most out of your next renovation project! Whether you are remodeling a bathroom, adding a new kitchen island, or just need help replacing doors or windows, Tuhavi is your trusted Tucson home construction and services provider! YOUR TRUSTED HOME REMODELING AND NEW CONSTRUCTION EXPERTS FOR OVER 30 YEARS! We are a locally owned residential and commercial construction company that has proudly been serving Tucson businesses and residents for over 30 years. We take the utmost pride in the quality of services, products, workmanship, professionalism, and customer satisfaction that is provided to clients in Tucson, Green Valley, and surrounding areas. Our services include new home construction, remodeling services, home additions, bathroom remodeling, kitchen remodeling and cabinetry, fire and water damage restoration, commercial construction, home services such as handyman projects and much more. We invite you to find out why we have such an outstanding reputation in the community as a provider of residential and commercial construction services. Our passion for providing excellent work with integrity on every single project we do has proven our success over the decades, even in stressful economic times. For all of your construction and home repair needs, Tuhavi is the right choice for you. We are licensed, bonded and insured with a reputation of excellence in the local business community. Call us any time and let us show you the difference we can make! Contact Us today so we can talk about your next project! See why so many of our customers recommend Tuhavi to their friends, family and neighbors when they need home remodeling or construction related services! 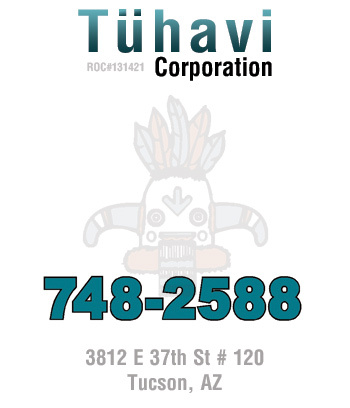 Tuhavi Corporation has over 30 years of experience working with local home owners and new builders right here in Tucson. We’ve maintained our reputation of excellence by providing high quality work at an honest price. Let us show you the Tuhavi difference! Contact Us today for information or a free quote. Our courteous professionals will give you a comprehensive breakdown of pricing and options. In this down economy, remodeling a bathroom or kitchen can vastly improve quality of life, giving you that new home feel without breaking the bank. Tuhavi’s practical approach to budgeting is the perfect solution instead of buying that new home. If you are in the ready and are in the right spot to build that new custom home, let Tuhavi’s 30 years of experience go to work for you! Together we will avoid pitfalls, choose the correct materials, building area, and take the hassle out of building your dream home. You may be ready to start a new business, or to expand your growing business into a new facility. Tuhavi has the experience you are looking for to create that perfect, sensible commercial structure that’s just right for you and your company. Anything from professional moving services to basic handy-man services. Our team of professional in-home specialists are courteous, trained, friendly and knowledgeable. With a dedicated staff, we're here to help you in any construction endeavor from maintenance to new construction! Take a look at some of our amazing projects that we’ve recently done.